Small, simple, with a free plan. So what’s the catch? Overpriced and underpowered, SecureVPN is effortlessly outpaced by the best of the rest. Even the free plan isn't a patch on the competition. SecureVPN is a US-based VPN provider which stands out from the crowd in several ways. And that would be great, except most of them are bad. The company's free plan sums much of this up, all on its own. 'Free' is always a plus, but the plan has some major restrictions, including a maximum 20 minutes per session, 1000MB data transfer per month, and only allowing one device to be connected at a time. The commercial Premium plan drops all these limits, and adds support for P2P and up to five simultaneous connections. Browse the website and you'll notice SecureVPN doesn't clearly mention how many locations it has, which seemed odd to us, as it's a major selling point for any service. Later, we found a possible reason for that; the free plan has only five in Luxembourg, India, Netherlands, Singapore and the US, a fraction of what you'll get with any quality provider. Prices for the commercial plan are average at $8 (around £6.15) per month, $5.83 (around £4.48) if you pay annually ($70 total – around £53.85). Some providers cost more, but others are much less, so for example Private Internet Access charges around $40 (£30.77) a year, or an equivalent $3.33 (£2.56) a month for what looks like a far more capable service. The content of the policy isn't quite as reassuring. There's a clear statement that the company "does not collect or log any traffic or use of its VPN", but it does collect the external and internal IPs for every service connection. As far as we're concerned, that IS logging use of the VPN. Another clause says, "we may collect and disclose personal information, including your usage data, to governmental authorities or agencies... at their request or pursuant to... legal process, if there is a good faith belief that [this] is required by law." In other words, they won't necessarily wait for a court order to hand data over: if an agency asks, and SecureVPN thinks they have a good case, that's enough. SecureVPN provides apps for Windows, iOS, Android and Mac. OpenVPN support suggests you may be able to set it up with other software and devices, but there's nothing on the website about this. We grabbed a copy of the Windows client. Installation was easy, although we weren't impressed to have to give permission for the client to bypass the Windows firewall. Just about every other VPN app we've used has managed to handle this itself. It only took a click, but still left us wondering what other basic steps the client might be missing. Getting online was easy, because the client has no settings beyond its very short list of just five locations: Luxembourg, India, Netherlands, Singapore, US. Choose one, click Connect and you're online. Well, sometimes: we found the client would regularly take 10 to 15 seconds to connect, and often it didn't work at all. Either way, there are no notifications to tell you when you're protected, or warn you if the connection drops. Even worse, with the free plan, the client counts the connection time against your 20-minute session. If it spends 5 minutes getting online, you'll only the 15 minutes left. We manually closed the OpenVPN.exe process to see if the client would detect that the VPN was down. 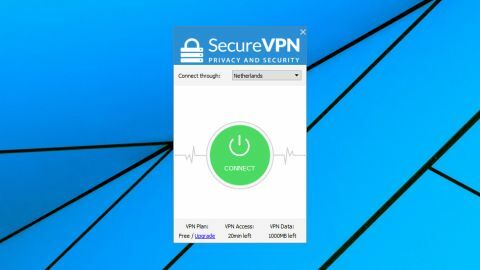 We would hope to be warned immediately, and for an app to reconnect, but SecureVPN didn't notice, and its interface still gave us the misleading impression that we were protected by the VPN. That's dangerous. With no settings, we took a look at the client's OpenVPN configuration file, to see if we could figure out anything more about the service. In one interesting feature, we noticed that the client was trying to make an OpenVPN UDP connection first, switching to TCP if that failed. That could be a smart way to cope with network problems, although we prefer clients to explicitly give us an explicit choice. What's even more disappointing is that the website appears to hide this, saying nothing about encryption beyond a sentence or two of very general marketing-speak: 'Using the same encryption technology, as military and banks, you don't have to worry that your data or identity will be compromised.' That's not good enough. Virtual Private Network providers must show themselves trustworthy to deserve our business, and that means being clear and up-front with customers, not hiding the truth with this kind of woolly vagueness. Our two local servers (Netherlands and Luxembourg) gave us decent download speeds, with Speedtest.net and Fast.com reporting performance of 45-50Mbps. The US and Indian servers, unfortunately, were largely inaccessible throughout the review. That's a problem when you only have five locations in total. We did manage to connect to Singapore, but the performance really wasn't worth the wait. We managed download speeds of a disappointing 5Mbs. Free VPN plans are generally a good way to attract our attention, but SecureVPN's network is so small, the restrictions are so tight, and there are so many other major problems that it's impossible to recommend.